I just wish they’d give me a reason to use something other than the classic Ebony/Ivory/Rebellion combo. All the other weapons I got were just too slow, imo. I didn’t think so. Balrog and Faust in particular were amazing. And I haven’t messed much with Cerberus, but it seemed pretty dang good too. I can’t even remember The names for most of them I used them so little. They all just move so slowly I’m constantly getting hit out of combos. Any confirmed news for DLC? I don’t want to believe that Bloody Palace is the only thing we’re getting. 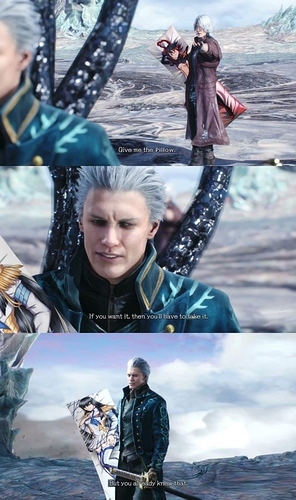 At least the reboot gave us Vergil story DLC. The scene with Lady and Trish at the end might have been a hint about something with them later. I think we’ll either get DLC or a DMC5 Special Edition at some point in the future, with Vergil being inevitable as part of it.